In the morning, flipping the switch in your bathroom can mean you will be greeted by an immediate blast of bright light, whether it is fluorescent, incandescent, or another style. If it is emanating from an overhead lighting fixture, you can’t escape it no matter how hard you try. Maybe you have some trouble seeing if you are finished shaving or applying makeup because your vanity lights just aren’t giving you enough oomph. If you experience one of these existential lighting crises often, it might be time for you to consider revitalizing and updating your bathroom lighting. Today, the Butler Lighting team wants to give you some unique bathroom lighting ideas to keep it fresh and functional, no matter your needs. Sometimes the vanity portion of your bathroom suffers from lack of lighting design. You may have simply not noticed that a single track light over your bathroom mirror was meant to support and illuminate the entirety of the space. This can be especially problematic when it comes to shaving your face or applying makeup. If you’re struggling to find a good solution, backlit mirrors can be the perfect fix. Whether you utilize special wall or track lighting to outline a mirror or opt for a specially made mirror with built-in lighting, a backlit mirror functions as a quality wall light while also ensuring you don’t miss a spot ever again. Speaking of wall lighting in your bathroom, wall sconces are always a phenomenal choice if you are aiming to revamp and illuminate your space. These lighting fixtures are not simply for common spaces anymore, but are useful for any room in your home. You may find yourself noticing a particularly dark corner of your powder space or you simply need something other than a single track light. In these unfortunate situations, bathroom sconces can be the change of pace you’ve been looking for. Because they do not take up too much space, can be installed at heights of your choice, and come in numerous styles, installing a sconce in your bathroom can solve countless lighting obstacles you may face. 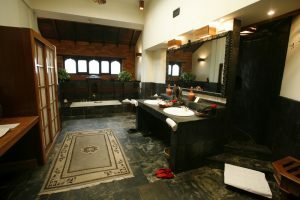 As we mentioned earlier, your bathroom is one of the first stops during your morning routine. When you flip that switch without proper acclimation time, your eyes will strongly protest to the sudden inundation of light. While we appreciate intensity in bathroom lights, especially in the vanity area, being woken up by it is a less desirable alternative than coffee. To remedy this situation, installing a dimmer switch can be your best option. Doing this will give you control over the brightness and how quickly you get to a certain level of illumination, as well as giving you options in your lighting settings rather than being subject to only one. 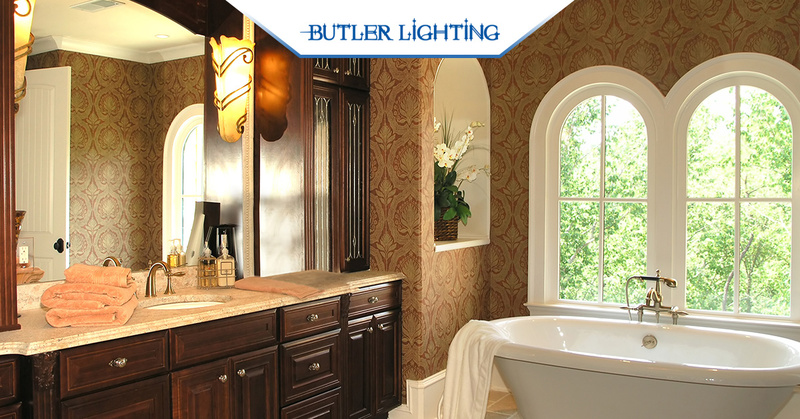 Whether you have your eye on a certain bathroom lighting fixture or need some help deciding, you can trust the experts at Butler Lighting. Our knowledgeable staff and wide selection of lighting will make your next project much easier to finish. Check out our online catalog and stop by one of our showrooms in the Greensboro area and see what makes us the best lighting company in North Carolina!